Sri Maha Mariamman Temple is locally known as Maha Uma Devi Temple and commonly called Wat Khaek. The word "Khaek" is a casual term used to describe people of Indian and Middle Eastern origins. Despite an increasing infamousness of the term, the word remains mainly neutral and commonly means "guest". Wat Khaek is a South Indian architecture style Hindu temple in Bangkok, Thailand. Vaithi Padayatchi, a Tamil Hindu man who immigrated to Thailand decided to build the temple in 1879 as a reminder of his culture and reflection of his belief. Maha Mariamman Temple is situated in on Pan Road cornered with Silom Road. It is the most significant Tamil Hindu temple in Thailand. 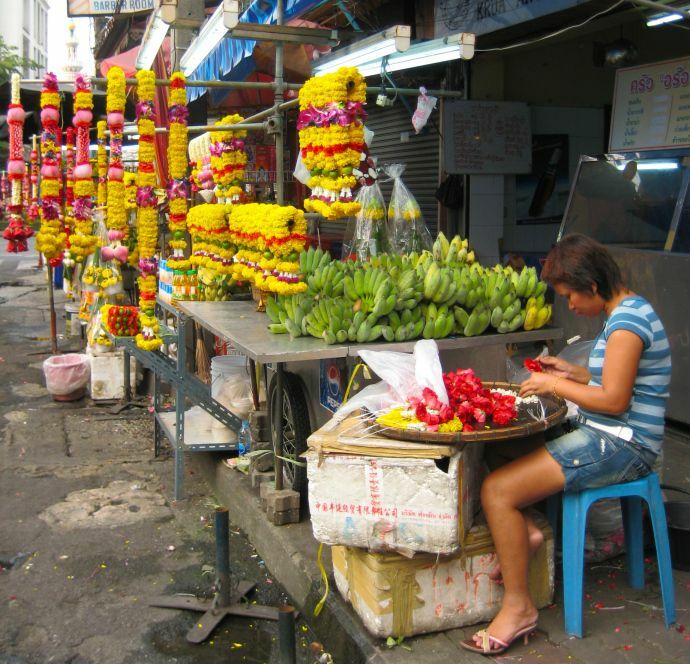 Further down Pan Road and corners nearby, there are several kiosks sell saffron-coloured marigold flower garlands for worshippers, some Indian food and desserts, as well as contrasting western style cafe and breakfast places. 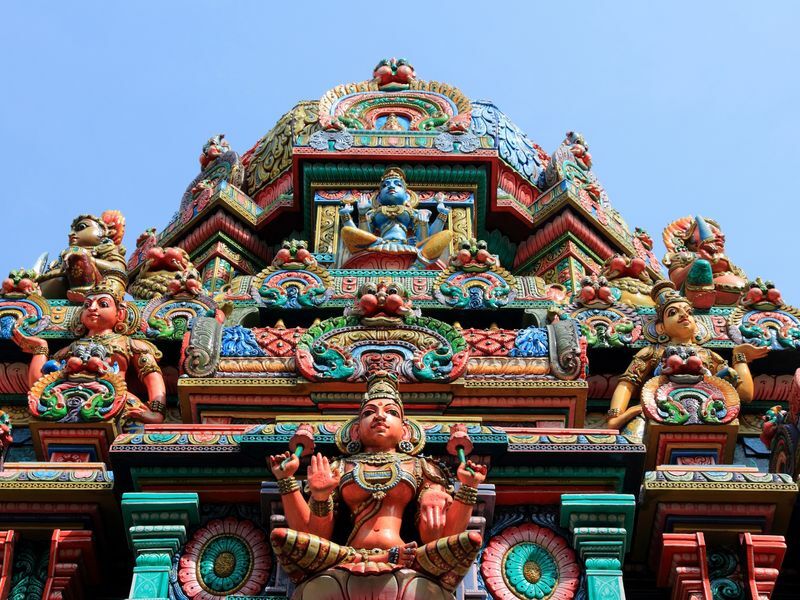 Maha Mariamman Temple's highlights are the outstanding florid style of temple's facade and multiple vividly colourful sculptures of god and goddess carved against the walls, roofs, and pillars in different shapes and sizes. The entrace is epically decored with gopura or tower of 6-metre tall. The most central part of this temple complex is the main shrine, featured with a dome covering of a gilded copper plate. Visitors can purchase flowers, garlands, coconuts and incense to be used in worship from the stalls available inside the complex. While Thailand has the majority of Buddhism practitioners, many Thai visitors believe that Hinduism is also part of Buddhism as it is deeply rooted in Thai culture. The 10-day Navratri festival is famously held in September/October of which on the final day, the temple and its front street will be colourfully decorated with yellow flower, garlands and candles. Silom road is annually blocked to allow the procession on the Sri Maha Mariamman image. Another important festival is called Deepavali. Visitors will hold the oil lamp ritual on most middays' and on Fridays to brighten up the temple while also be distributed the God-blessed food. Wat Khaek is located right between the charming district of Bang Rak and the CBD of Silom. We recommend anyone to visit despite your belief. It is just very interesting to see both architectual and cultural aspects of Hinduism outside India where Indian descents never fails to keep in their traditions. Most importantly, there is no admission fee while a donation is encouraged.